Today, most people are having difficulties getting a good night’s sleep. It is the most important beauty aid that nature gave us, and yet, it should be natural, but statistics say over 50% of the American people, aren’t getting eight hours sleep, let along six. Lately it appears that everyone is complaining about not getting enough rest and can’t get to sleep without some sort of sleeping aid. Sleeping pills are selling like “hot cakes” and depression seems to be at an all time high. Sleep depravation is the maior cause of depression and is also the cause of high cortisol surging through one’s body creating unnecessary weight gain, high blood pressure, irritability, and a myriad of other maladies. Sleep is nature’s way of repairing our systems and without eight hours per night, we will develop serious problems. How do we solve this “lack of sleep” problem? It takes trial and error with testing of many factors before you hit on the lucky combination, then with a couple of days of eight hours per night you will look and feel like a bear after a winter’s hibernation. Dr. Michael Roizen, M.D. and the famous Mehmet C. Oz, M.D. (Oprah‘s favorite) claim the following: “Get the best mattress. We believe there are four things in life you should overpay for. The first three: pillows, mattresses, and their coverings. The last was a good kitchen knife. Number one: Purchase a good, I mean good, mattress and box spring. I highly recommend a custom made mattress and box spring by Schrader Mattress Company. “We sell sleep,” says Diane Schrader, daughter-in-law of the founder of EJ. Schrader. “If you can dream it we can build it.” After visiting their plant in West Palm Beach I have become a total convert to custom bedding. Diane explained to me that most of their custom beds are constructed with eight layers of materials and their organic mattresses are comprised of organic cotton and wool and whatever is used to construct these beds is totally organic. It is easy to see how one could get a perfect night‘s sleep on one of these mattresses as they measure your body plus take into consideration any skeletal or muscle problems you might have. For example, if you have a bad lower back they will build up that portion of the mattress but leave the upper part of the mattress softer. If you have a sleeping partner, their side of the bed is custom made also, so your sleep isn’t disturbed. 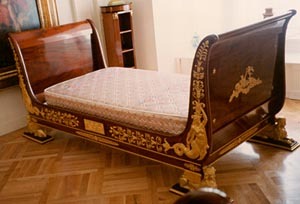 Gianni Versace was so impressed with Schrader beds he hired them to custom make every bed in the Miami Versace Mansion. They ship all over the world and some of the most famous people sleep on a Schrader bed. Once you experience a Schrader mattress you understand why. It is indeed like sleeping on air. You can own a Schrader bed for as little as $1,200 or as much as $8,000.00.